I know I start practically every blog post this way, but I'm sorry it's been so long. I have buckets of good excuses. I considered going into them, but I won't. Let me just tell you a funny story. Back in October 2016 (OMG, almost a year ago! ), we were driving to the annual Toddler Nightmare at the Pumpkin Patch (in which we join thousands of other parents and their equally whiny, snotty offspring in the muck and mire of a Seattle October in order to gape at slightly harassed barnyard animals and purchase over-priced gourds in the name of "childhood"). 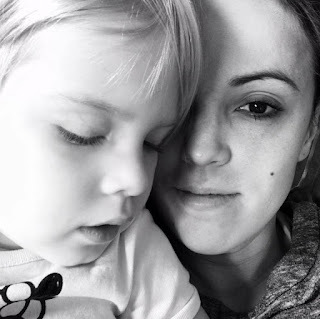 Avery was having an especially whiny morning, and with a good 15 minutes of drive time yet to go, she demanded that "dada" get out of the car. As Dada was driving, this was rather problematic. Trying to avert a tantrum, Mark gamely explained to his hostile offspring that "if dada gets out of the car, the car will stop." And then something strange happened. Avery repeated this fundamental truth, with one subtle addition: "If dada gets out of the car, the car will stop...and so will the cribbage." We asked her to say it again. There is was, clear as day: "If dada gets out of the car, the car will stop. And so... will... the... cribbage!" Now, of course, we've made two critical mistakes. She knows that she's sparked something because we've asked her to repeat it. We've also laughed, which means that whatever she has just said must be fun or funny. We spent the rest of the car ride to the pumpkin patch and the entire ride home repeating this confusing little mantra, one of us saying, "if dada gets out of the car, the car will stop..." and Avery chiming in with a sing-songy "...and so will the cribbage!" Fast forward several months. Periodically, Avery would make the car/cribbage demand. Every time, she'd chime in with "and so will the cribbage" and every time Mark and I would just look at each other absolutely baffled. A few times, we tried asking her what she meant by "cribbage" or where she'd heard the word, but she'd just laugh and say "it's cribbage, mama!" Le sigh. One afternoon in late Spring, Avery asked me to read her a book called Little Blue Truck Leads the Way. One of Avery's favorite books, we'd read it hundreds of times. All of a sudden, Avery jabbed her finger at the page: "Mama, the cribbage." And suddenly, it all became clear. She meant "cabbage." 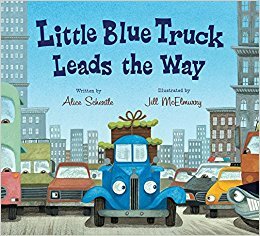 As in the vegetable that the little blue truck is transporting in the book. Note the round green things in the baskets at the back of the truck in the picture below...CABBAGE. How Avery conflated the little blue truck and our car, I won't speculate. How, when Mark started talking about stopping the car, her mind went to cabbage -- a vegetable I'm pretty sure I'd have to bribe her with an entire pint of ice cream to get her to eat -- I will never know. But folks, let it be known that if dada gets out of the car, the car will stop, and so will the cabbage. Can I please just crave a doughnut?